When it comes to new apple and grape varieties, you could say Dr. Sean Myles’ work with genomics has born enough fruit to make him one of the country’s leading plant genetics researchers. Using genomics, Myles can detect and track desired traits in seedlings, which can help those developing new cultivars be certain of some fruit attributes as soon as the seeds germinate – in other words, much more rapidly than the many years needed to grow a tree and wait for it to bear fruit. The genomic-based process is also acknowledged to be cheaper and it could also be more efficient. A Fredericton, N.B. native, Myles holds the Faculty Research Chair in Agriculture at Dalhousie University. Through his Apple Diversity Group in Kentville, N.S., he has amassed a very diverse apple tree collection of more than 1,000 varieties from many parts of the world, in a collaboration between Agriculture and Agri-Food Canada and Dalhousie University. While aiming to better understand genetic apple diversity, he also hopes to learn more about fruit biology and how to breed productive cultivars with less reliance on pesticides. Currently he is involved in a 10-year project to assess new varieties of apples for traits such as disease resistance and sweetness, sequence the genomes of the fruit, and look for relationships between DNA sequences and the traits associated with them. The book, Grapevine Breeding Programs for the Wine Industry, credits Myles with reviving grape breeding in Nova Scotia through his work with Dr. Andrew Jamieson, an Agriculture and Agri-Food Canada fruit breeder, that has led to the development of several promising new varieties for the Nova Scotia wine industry. Apples and grapes hold more than passing professional interest for Myles. His wife, Gina Haverstock, is a sommelier and the award-winning winemaker at Gaspereau Vineyards and in 2016 the pair opened the Annapolis Cider Company in Wolfville, N.S. Myles’ research interests in genomics go well beyond apples and grapes, however, and he has looked into disease-resistant hops, found the gene that gives rise to blond hair in dark-skinned Melanesians, and tested commercial cannabis varieties against their marketing hype. He works with a range of industry partners, which, among others, have included the Canadian Horticulture Council, the Nova Scotia Fruit Growers Association and Anandia Labs, a Canadian cannabis research company. Genome Atlantic: Five years ago in Canadian Geographic you stated, when it comes to apples, “everyone is getting out of the breeding business.” You doubted your team would ever have a breeding program for new commercial apple varieties because it was cheaper to “buy some new chemical and go and kill the pathogens that are killing your plants than it is to grow a new apple variety that is resistant to pathogens.” Has anything changed to make you more optimistic? It’s an exaggeration to say that “everyone” is getting out of the apple breeding business, but there has certainly been a significant reduction in the number of apple breeding programs in Canada. What does make me optimistic is that we have successfully consolidated resources from coast to coast and have established a National Apple Breeding Consortium – essentially a unified Canadian apple breeding program in which our lab plays a role. Those who specialize in genomics, for example, no longer have to evaluate advanced breeding lines in the field, while those who have expertise in fruit quality evaluation in the field can focus on their particular strength without worrying about the genomics. What we expect is that, by bringing together a diversity of researchers, growers and other industry partners, each group can focus on what they do best and we can in fact accomplish more as a single national entity than we ever did as divided regionally focused breeding programs. I’m tremendously optimistic about what we can accomplish, but keep in mind that we’re playing the long game here: an evaluation of our impact can only be made after at least a decade of trying out this new model. Genome Atlantic: How difficult is it to pinpoint the commercially desirable traits in apples or grapes? Is this the most challenging aspect of using genomics in plant breeding? Growers and processors are more than happy to share with us what they feel are the commercially desirable traits that should be the targets for fruit breeding. Unfortunately for the geneticist and the breeder, they are numerous and sometimes elusive. Growers want plants that require less chemical input to grow – that grow in a manner which reduces labour in the field - and that produce fruit that looks and tastes highly desirable to the consumer. Disease resistance is fairly straightforward – we have several targets already that many breeders work on. Growth habit and consumer desirability are trickier to tackle. As a scientist, this makes things more interesting though – how do we measure what the consumer really wants and then rapidly breed for it using genomics? The Canadian National Apple Breeding Consortium is particularly well equipped to tackle this, and it is precisely in this area of “fruit quality genomics” where we feel we can take the lead internationally. Genome Atlantic: Through your connections with the U.S. Department of Agriculture you were able to duplicate its entire stockpile of apple cuttings for your Apple Biodiversity Collection. Do the Americans have any ongoing interest in your work with the collection? Our work on apple genetic diversity is not only of interest to the US Department of Agriculture because of our strong collaborative relationship, but to apple researchers worldwide. Our collection of over 1,000 apple varieties here in Nova Scotia is just beginning to reap its rewards in terms of scientific insights and there is intense interest around the globe in the results of our work on this unique collection of apples. We anticipate that we will continue collaborating not only with the USDA on projects that make use of the Apple Biodiversity Collection, but with researchers from other countries as well. Genome Atlantic: How important is it for Canada and its fruit growers, particularly those in Atlantic Canada, to support using genomics in plant breeding? Apple growers know how to take the long view. 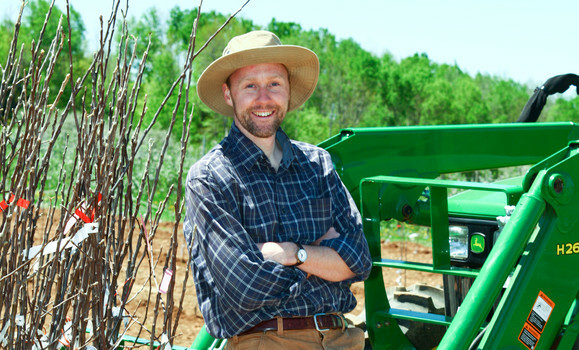 When you establish an orchard, you make a business plan that extends 30 years into the future. Investing in genomics in apple breeding is highly similar: it will likely take at least 20 years before the insights we are gaining now will result in a benefit to a grower’s bottom line. This is not unique to Atlantic Canada – it’s the same everywhere in the world. With our newly established National Apple Breeding Consortium, communication between genomics researchers and industry members is improving dramatically, especially as it relates to the timelines of the deliverables from genomics, and I’m confident this will result in a win-win scenario for the Canadian apple industry. Genome Atlantic: The Annapolis Cider Company that you and your wife opened in Wolfville is a new boutique beverage business built on Annapolis Valley apples. At the time, Dr. David Gray, Dalhousie’s faculty of agriculture dean, hailed the venture as “a fantastic example of science in action.” Could this type of enterprise be a model for future business development in the region, as the dean suggested? It is our sincere hope that our business becomes a model for future entrepreneurs in our region. We believe strongly that new businesses producing novel value-added agricultural products are key to rural economic sustainability in Nova Scotia. In turn, we’re trying hard to convince the public that consuming these products, and getting on the buy-local train, is part of the solution to our rural communities’ looming economic woes. Everywhere we look we see people desperately desiring premium, value-added agricultural products – the demand is there! I’m convinced that if others follow in our footsteps and manage to build sustainable businesses based on products made from the agricultural land around us, we can all experience a net positive impact on our economy, our health and our society overall.